If you go to the Oktoberfest this year, you’ll see lederhosen and dirndls in all shapes and sizes – the women’s clothing especially changes with the fashions, and you see a full range of designs and colours. But lederhosn and dirndl are of course traditional clothing that, until quite recently, had remained unchanged for many years and were associated primarily with the farmers and shepherds of Bavaria, not its capital Munich’s biggest party. Before we tell the story though, there’s a few important facts about lederhosen and dirndls that are often forgotten. 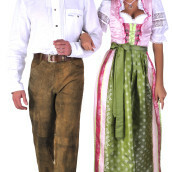 Firstly, they are not German national dress: they are Bavarian dress. And although Bavaria once was a country (and is still proudly independent), for that reason, they are not a national dress, but a regional costume. Secondly, lederhosen and dirndl – or “Lederhosn” and “Diandl” as Bavarian dialect calls them – are both traditional festive clothing and practical work uniforms. Farmers, shepherds, gardeners, carpenters: in the country, you’ll find Bavarian men who regularly wear lederhosen because they are tough and durable; for many busy housewives and cooks, too, the dirndl has a practical role (it is worn with an apron after all!). These “work clothes” are usually not particularly decorative. In their second role as traditional dress – termed “Tracht” in German – lederhosen and dirndls get more ornate and are worn with a range of other articles and accessories. It is this version of Bavarian clothing that you’ll see at the Oktoberfest, and all of the fashionable Bavarian gear you can buy and wear as a tourist is based on these more delicate, colourful items. This difference between everyday and special clothes is important to understanding the history of Bavarian dress. Although in the countryside the work-a-day versions of lederhosen and dirndls have survived in their role without interruption through to the present day, they were never popular amongst town-dwellers. So cities like Munich swelled in the 1800s, the peasants who moved in from the countryside stopped wearing lederhosen and dirndls to avoid looking uncouth: the higher up the social and economic scale people moved, the less they wanted to be seen in traditional dress. Then again, every reaction has a reaction, and by the end of the 1800s, Bavarians were worried that their traditions were dying out during the race to modernity, and the first “Trachtenvereine” – or traditional dress clubs – were founded. These clubs were of course more interested in the special, ornate versions of the dress worn for religious high-days and important events such as marriages and village festivals. Many of these “Trachtenvereine” exist today, keeping alive the wealth of details that make true Bavarian dress so fascinating: the Miesbacher Tracht, for example, is known for its complexities which allow the men especially to display their social standing through things like the number of metal charms on their chains or the size of the goat’s hairs sprouting from their hat. You’ll see the Trachtenvereine at the Oktoberfest, and if you ask their members, they will be delighted to explain the details of their clothing. They’ll also explain to you that, until the mid-1990s, they were probably the only people wearing traditional Bavarian costume at the Oktoberfest. Firstly because, as mentioned above, Tracht was never associated with cities in any case, and the Oktoberfest is the festival for Bavaria’s biggest city, Munich; and secondly because Germany after the Second World War was a country with complexes about its traditions, which had often been perverted and thus devalued by the dictatorship. Many young people in Munich in the 60s, 70s, and 80s were wary of traditional costume because they were wary of tradition as a whole. Now that Germany has proved itself to be a stable and open society, however, today’s younger generation is happier to play with traditions and be proud of them and their long history. Visitors, too, love the exotic yet traditional look of Bavarian dress, delight in the variety of colours and styles now available, and enjoy feeling special for the world’s biggest and best party!